Following the three ministerial decrees of January 2016, all employees across the UAE will be presented with a standard Job Offer that contains clear and binding terms of employment, prior to the worker’s entry in the UAE, or prior to the change of status in case the worker is already in the country. If an employee is coming from abroad, the contract must be signed before he arrives to the UAE. Subsequently both the employer and the employee will need to sign the employment contract which cannot be significantly different from the job offer. The Employment Contract needs to be registered with the Ministry and any change or addendum to the terms of the employment need to be approved of by the Ministry. What you need to know about the new standardized Offer Letter The Contract contains 12 clauses regarding the obligations and rights of both employer and employee. Like the old employment contracts, the new Contract contains basic information regarding the employer and employee. The information include the names and addresses of both the employer and the employee, the nationality of the employee, the employee’s profession, job title and basic remuneration allowances, the date the employment begins and the duration of probation (cannot be longer than 6 months), if any. One clause explains that both party can end the employment relationship if they choose to, subject to certain legal consequences. However, given the new decrees, the legal consequences generally mean giving a proper notice (as agreed, between 1 to 3 months) of intentions to terminate the employment, honoring the employment obligations and indemnifying the other party as agreed. Another clause states that the employee is entitled to a weekly rest period (either 1 or two days) and obliges the employer to determine such period prior to commencement of employment. Three clauses (clauses 7, 8 and 9) stipulate that both parties acknowledge they have reviewed the clauses thoroughly and understand the terms of the employment along with attached Annexes that explains in more details the applicable laws and regulations of employment in the UAE. Furthermore these clauses specify that all the terms of the offer should be binding on both parties. 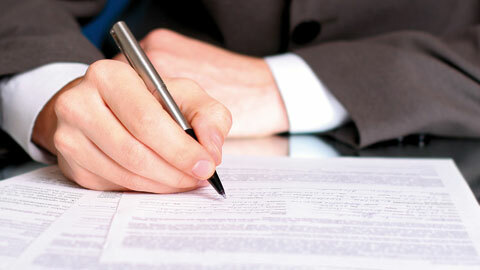 Additional terms of employment can be added in the last clause of the contract. However, these additional conditions must be in compliance with the labor laws and can be binding subject to the approval of the Ministry of Labour. On September 27, 2015, the Ministry of Labour introduced three decrees, which come into effect at the start of 2016, to ensure more transparency and clarity of the Labor Contracts and termination related issues, greater protection for employees and to provide for a more balanced and flexible work environment. The three decrees are primarily dealing with Employment Contact and Offer Letters, Termination of Employment, and New Work Permit and related Labor Bans. The new decrees require that an employee sign an employment offer letter, which will be binding as a legal contract on both the employee and employer, that ‘conforms with the Standard Employment Contract’ prior to issuing a work permit and a residency visa. This also applies in the event the employee, residing in the UAE, is switching employers/jobs. The Standard Employment Contract must match the terms of the offer and its terms cannot be changed by either employee or employer unless the terms are more beneficial to the employee. This will help reducing the risks of confusion and any wrong-doing as both the employee and employer are aware of the terms of the employment. The new decrees also deal with termination of employment. Practically speaking, nothing has changed regarding the implications or means of terminating an unlimited contract other than that the notice period cannot be less than 1 month or more than 3 months. However, in the case of a fixed-term contract, more impact is to be seen with the new decrees coming to effect. In addition to the expiration of a contract period, for a fixed-term contract (two years), or fundamental breaches of labor law by either party (Articles 120 and 121 of the UAE Labour Law), an early termination of a fixed-term contract is allowed by mutual consent or unilaterally (by either party), provided that (1) the terminating party notifies the other party of its intention to terminate (minimum 1 month and maximum 3 months prior to termination date), (2) honors the employment obligations during the notice period and (3) pays the agreed compensation. Both the employee and employer may agree on the amount of compensation for an early termination, to be included in the offer letter and the Standard Employment Contract, up to a maximum of 3 months’ salary. This reduces the likelihood of lengthy and costly employment-related lawsuits, for the purposes of seeking compensations, since both the employee and employer are fully aware of their rights and obligations when terminating the employment. 1. The contract term has expired and not renewed. a period of at least 6 months (the 6 month period is waived if the employee has a high school diploma or higher). 3. Either party unilaterally terminates the employment after the expiry of the first fixed-term contract provided that: (1) the terminating party notifies the other party of its intention to terminate; (2) honors the employment obligations during the notice period; and (3) in case of a fixed-term contract, pays the agreed compensation, or in case of an unlimited contract, the employee has completed a period of at least 6 months (the 6 month period is waived if the employee has a high school diploma or higher). 4. The employer terminates the employment (without the employee’s fault) provided the employee has completed a period of at least 6 months (the 6 month period is waived if the employee has a high school diploma or higher). 5. The employer has failed to meet its contractual or legal obligations, including but not limited to failure to pay the employee’s wages for more than 2 months. 6. The employer is shutting down its business. entitled to: (1) no less than two months of work; (2) arbitrary or early termination compensation; or (3) any other entitlements that the employee is denied for no lawful reason including granting of end-of-service gratuity. For further details please see our brochure UAE Labour Law. Under UAE Labour Law, the employee and employer can agree on a probation for a period not exceeding six (6) months, during which the employer may terminate the employment without notice or end of service benefits. Furthermore, and upon successfully completing the probation period, the required notice period to be given by the employee or the employer to terminate the employment shall be between one (1) to three (3) months. In the event of termination by either the employer or employee, certain obligations apply to the terminating party, given the nature of the agreement – i.e. limited and unlimited, in terms of end of service benefits and payments in lieu of notice periods. three (3) months, if the period of continuous employment is 5 years or more. Furthermore, under DIFC Employment Law, parties can agree on longer or shorter period of notice or even waiving notice or accepting a payment in lieu of notice. DIFC Employment Law, does not distinguish between a limited or unlimited employment agreement, and terminating an agreement is generally governed by the terms of the agreement, subject to notice period requirement and other obligations defined by DIFC Employment Law. 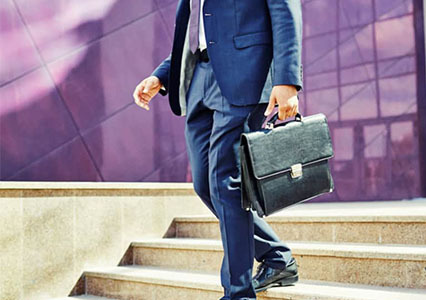 UAE Labour Law grants employees, who have been continuously employed for more than six (6) months, a period of annual leave of two (2) days per month, starting from the first day of employment, where the employment has been less than one (1) year and thirty (30) days per year where the employment has been more than one (1) year. Under UAE Labour Law, all national holidays made by law or agreement, weekends and/or sick days, if any, will be part of the annual leave if such days fall within the period of annual leave. 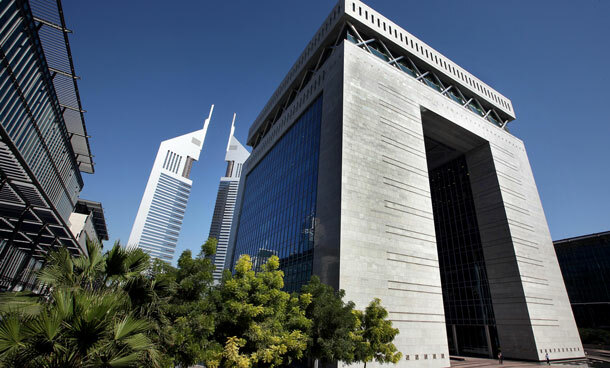 DIFC Employment Law, on the other hand, grants vacation leave of twenty (20) working days per year to the employees who have been employed for at least three (3) months. Furthermore, the annual vacation leave is exclusive of national holidays, weekends, maternity leave and sick leave or any other days of absence from work as agreed between the parties. Under UAE Labour Law, no sick leave is given to an employee during probation period and only after three (3) months into the continuous employment following the probation period, the employee is entitled to ninety (90) days of sick leave per year. Furthermore, the employee is entitled to full paid sick leave for the first fifteen (15) days with full pay. The employee is entitled to half day payment for following thirty (30) days of sick leave and the remaining forty five (45) days of allowed sick leave per year are non-paid. On the other hand, under DIFC Employment Law, an employee is entitled to a maximum of sixty (60) working days in aggregate per year. Please note that, the employee is entitled to be paid at the rate of normal daily wage for the entire period of sick leave. Please note that, where an employee takes more than an aggregate of sixty (60) working days of sick leave in any twelve (12) month period, the employer may terminate the employment immediately with written notice to the employee. Under UAE Labour Law, an employee is entitled to full paid maternity leave for a period of forty five (45) days per year if she has been continuously employed for at least one (1) year. If an employee has been continuously employed for less than one (1) year, her paid maternity leave will be reduced by half. Please note that, UAE Labour law, allows an employee to take longer maternity leave, due to complications of pregnancy or delivery, beyond forty five (45) days for a maximum period of hundred (100) continuous or intermittent days without pay. UAE Labour Law, does not recognize, up until now, maternity rights to a female employee who is adopting a child. By contrast, DIFC Employment Law grants maternity rights to an employee who is adopting a child of less than three (3) months old. A DIFC employee is entitled to a minimum maternity leave of sixty five (65) working days. Furthermore, an employee is entitled to be paid during the minimum maternity leave if she has been continuously employed for at least one (1) year prior to the expected or actual week of childbirth. fifty (50) per cent of the employee’s normal daily wage for the next thirty-two (32) working days of maternity leave. Generally, under both DIFC Employment and UAE Labour Laws, an employee who has been continuously employed for a minimum of one (1) year, is entitled to gratuity payment at the termination of the employment. Both Laws calculate the payment of gratuity in the same manner, i.e. the gratuity shall be 21 days’ basic wage for each year of the first five years of service and 30 days’ basic wage for each additional year of service provided that the total of the gratuity shall not exceed the wages of years of service. 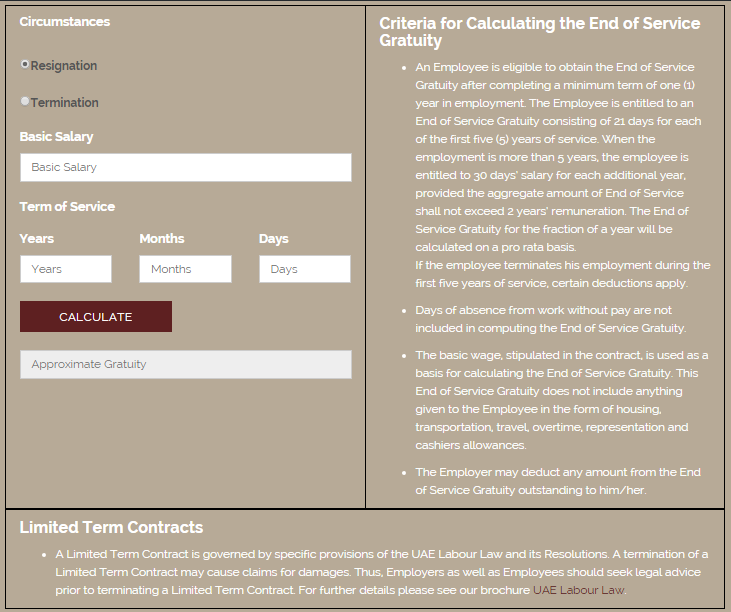 However, under UAE Labour Law, in the event of a resignation by the employee, the amount of gratuity will be significantly reduced, if the continuous period of service does not exceed five years. At the termination of employment contract an employee in the UAE is entitled to a set of various things. One of them is the end of service gratuity which is calculated on employee’s duration of the employment. 21 day’s wages for each year of the first five years. 30 day’s wages for each additional year on condition that the total of the gratuity shall not exceed the wages of two years. When an employee has completed one year of employment with the employer, gratuity is calculated on an annual basis. The day of absence from work without pay shall not be included in calculating the length of service. However, if the employee completed a year in service s/he will be entitled to a gratuity for the fraction of the year proportional for the part of the year s/he spent in work provided that he has completed one year in continuous service. Click the link to use the gratuity calculator now. Last basic wage received by the employee, before the termination of his/her employment contract, is considered as the unit for gratuity calculation. A basic wage means anything received by the employee as a wage excluding housing, transport, travelling allowances and overtime, family allowances, entertaining allowances and any other allowances or a bonus. This wage is taken as the unit for calculating the gratuity for all the years during which the employee has worked for the employer. The employer may deduct any amount due and payable to the employee to the employer from the end of the service gratuity and make payment for the balance to the employee. If there is any dispute over payment of gratuity or amount payable to the employer, the matter should be put to the labour office for mediation. If an employee employed under a contract for unlimited period resigns after a continuous service of not less than a year and not more than three years then s/he is entitled to one third of the end of service gratuity. If the period of continuous service was more than three years and less than five years s/he is entitled to two thirds of the gratuity. If his continuous service is more than five years, s/he shall be entitled to the full gratuity. If an employee who is employed under a contract of limited period, resigns with his free will before the end of the contract, s/he shall not be entitled to the end of service gratuity unless his continuous service exceeds five years. Gratuity will only become due and payable at the end of or at the termination of the contract. Contact us today to discuss your UAE labour law issues. Expatriates and business owners have warmly appreciated the recent reforms to the Labour Law of UAE. Minister of Labour Saqr Ghobash in his press conference to the journalists told that these labour reforms aim to tighten oversight of employment agreements for temporary migrant workers. These reforms will come into effect from January 2016. Under the new reforms and policies, prospective foreign workers would be asked to sign a standard employment offer in their home countries. The contract would be filed with the Ministry of Labour before a work permit was issued. That agreement would then be registered as a legal contract once the worker arrives the country and no changes would be allowed unless they were additional benefits that the worker agreed to. labour permits to work for new employers. Either side (the employer or worker) can terminate the contracts under terms spelt out in the ministry decree. Once that is done workers are free to switch to a new employer. The main goal of these reform is to ensure transparency and compliance in matters related to labour contracts, including terms of termination. The new laws would benefit both the employer and the employee. 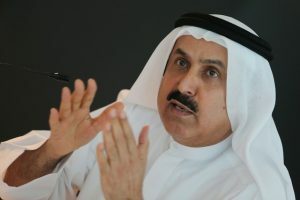 Mr Al Meqbali, who also sits on the board of the Abu Dhabi Chamber of Commerce and Industry, said the changes would provide more flexibility because with the reduced time for transferring employees and their contracts, companies will be able to quickly put workers in the right positions, while employees will have better ability to find the job they want. The labour reforms would curb abuse of foreign workers by employers. There are so many sad stories about contracts not honoured by abusive employers. Expat are left with no choice but follow the employers. (Cristina Magallon, chief editor ofUAE DNA Blogazine, a Dubai-based online publication).